Information derived from New York city directories indicates that Henry Clay Seward (1829-1896) had a brief career as an iron founder in the 1850s and early 1860s, then switched gears and made his living as an insurance broker until his death in 1896. Initially (from around 1854 to 1860) Seward worked at Daniel D. Badger's Architectural Iron Works with offices at 42 Duane St. and foundry on E. 14th St. at Ave. C. Then from 1861/62 through 1865 his address changed to 233-241 E. 17th St. between Ave. A and Ave. B. 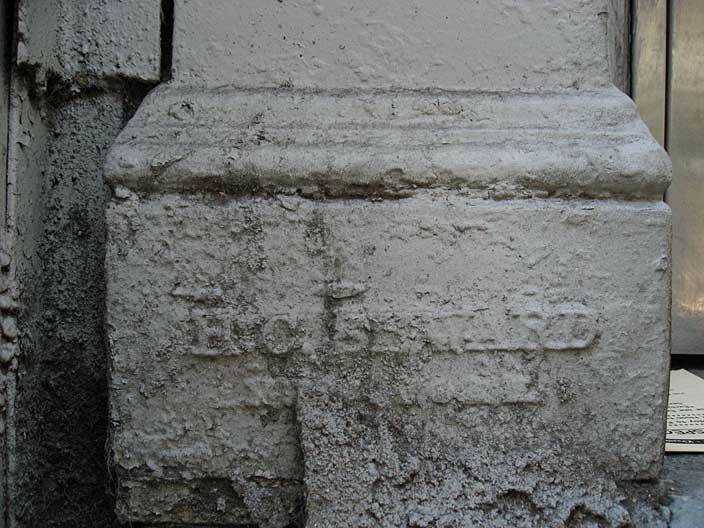 This is probably the period when he had his own foundry, and the foundry mark shown above would date from this time. Seward was born in New Jersey, 6 June 1829, the son of Henry Seward (born 15 Aug. 1793 in New Jersey) and Beulah Ann Cooper (born 17 June 1800 in New Jersey). He married Maria Emma Allaire (1830-1896) 10 Jan. 1855 in New York City. The couple had two children, Willis A. Seward and Eloise A. Seward. Henry C. Seward died 28 March 1896. His wife, Maria Emma Allaire, died later the same year, 20 June 1896. Henry C. Seward was recorded in the U. S. Census of 1860 living in New York City's 17th Ward, District 8. He was 30 years old, born New Jersey, and his occupation was "Iron Foundry." His wife, Marie E., was 23 years, and their children were Aiantius, age 4, and Henry F., 7 months. In the 1870 census Henry Seward lived in New York's 19th Ward, District 1. He was 39 years old, and his occupation was "Insurance Broker." His wife, Marie, was 33 years old, and their children were Eloise, age 14, and Wills, age 5. There were also two domestic servants living with the family. In the second enumeration for 1870, their address was specified as the Broadway Hotel, 1423 Broadway. In the U. S. Census of 1880 Henry C. Seward lived in Mt. Olive, Morris County, New Jersey. He was 50 years old and gave his occupation was "Farmer." His wife, Marie E. was 42 years old, and their children were Eloise A., age 23, and Willis A., 14. A niece, Agnes L. Greig, also lived with them. Trow's 1866 Copartnership Directory for New York City listed Henry C. Seward as a partner in Rathbone Brothers & Co., insurance brokers at 92 Broadway. By 1869 Seward was in partnership with Henry J. Hopwood as Seward, Hopwood & Co. at 11 Pine St. This partnership lasted until around 1879. Hopwood was an immigrant from England, who seems to have tried to make a living as a draughtsman and architect before he switched to insurance. He was recorded in the 1860 U. S. Census living in Brooklyn, age 26, when he gave his occupation as "Architect." In the 1870 and 1880 census reports Hopwood lived in New Jersey and declared himself an "insurance broker." New York city directories listed Henry Seward's home as New Jersey beginning in 1871. Beginning in 1887, his address was Budd's Lake, Morris County, New Jersey. Budd's Lake is described in the following terms in Appleton's Illustrated Hand-Book of American Summer Resorts, 1893, "This beautiful lake (also called Lake Senecawana) is situated among the Highlands of New Jersey, and is reached from New York via Morris & Essex Div. of the Delaware, Lackawanna & Western R. R. to Stanhope. Stages connect with the trains, and run direct to the Forest House (250 guests; prices by the week very reasonable), from which the entire lake is visible. the lake is nearly circular in form, is 3 1/2 miles in circumference, deep, clear, and abounding in fish. The common pastimes are fishing and boating, but the surrounding country is extremely picturesque, and there are fine views of mountains in the distance." Henry Seward's son, Willis A. Seward (1865-? ), succeeded him in the insurance business in New York after his death. Willis Seward maintained offices on State St. and Liberty St. in downtown Manhattan from 1897 to 1939. Willis Seward can be found in five successive U. S. Census reports from 1880 to 1930. For most of these Willis Seward lived in Mount Olive Township, Morris County, New Jersey, and he often described his occupation as farmer. One of his prize-winning boars made news at the 1896 live stock show at Madison Square Garden when he chased a press agent and knocked a judge to the ground (New York Times, 27 Nov. 1896). Willis Seward seems never to have married and lived with his cousin, Agnes Louise Greig, in all five census reports.